Artificial Grass in Walnut Creek, Contra Costa County, California & Beyond. When you’re looking for artificial grass in Walnut Creek, Contra Costa County, CA, Watersavers Turf has just what you need. As the premier suppliers of artificial grass in Walnut Creek, Contra Costa County, CA, we’re the one-stop shop for your project. We carry more than 40 styles of turf, so you can get the perfect surface for your goals. Looking for tools to install and maintain it? We carry them too. If you’re a contractor looking to get in the business of installing artificial grass in Walnut Creek, Contra Costa, CA we’ll teach you everything you need to know. If you’re looking for a pro installer for your project, we’ll refer one. It’s all part of our effort to provide you with the best service possible. 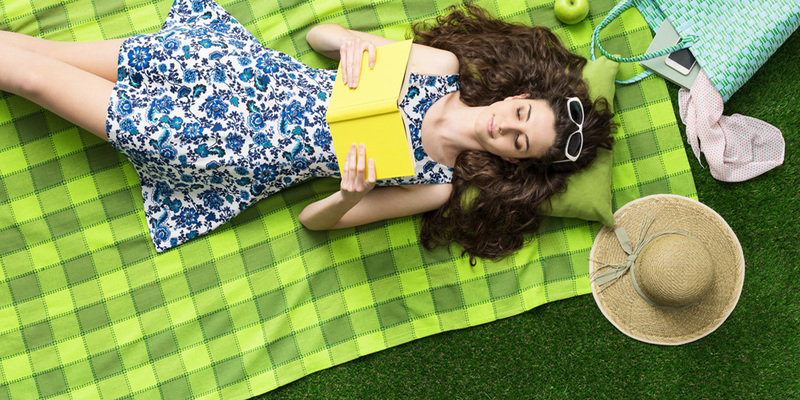 You could spend days reading about the many benefits of fake grass in Walnut Creek, CA. If you’re looking to save money, replacing your grass lawn is a smart move. You don’t need to water, mow, or reseed it. The cost to maintain this kind of surface over the years is very low. 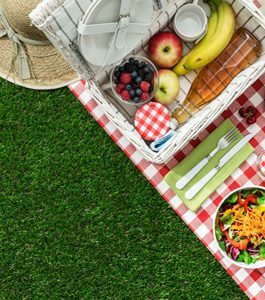 Our products are all non-toxic and lead-free, making safety yet another one of the benefits of fake grass in Walnut Creek, CA. There are many benefits of fake grass in Walnut Creek, CA to consider. These are just a few. Fake grass is also an ideal surface to use when you design your dream lawn. You can trust that it will look great all year long since it stands up to bad weather and normal wear-and-tear. For those who own a home, this means you get to indulge your inner landscape artist. 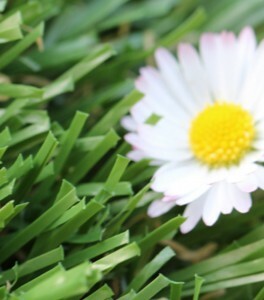 If you own a business, your good-looking lawn will attract more guests. If that doesn’t convince you, maybe you need more details. Switching to our products can save you more than $2,000 per year in lawn care costs, along with 30,000 gallons of water. To learn more about what you could save, see our Annual Cost Savings Chart. School districts could use that extra money to keep more teachers on staff. Families can use it for a college fund. Business owners might find they now have money to expand their staff. No matter how you use our products, you’ll be glad you did. Watersavers Turf offers exclusive benefits for lawn replacement in Walnut Creek, CA and beyond. In fact, we’re the only supplier in Northern California with an 18-year residential use warranty on artificial turf (10-year commercial use). Those aren’t our only exclusive turf benefits. If you’re a contractor, now is a good time to learn how to do lawn replacement with synthetic grass. It’s already a big business. As more people find uses for these products, there will be more demand for crews that know how to install it. Because of this, we offer free classes for contractors. Check out our class schedule for more info. Even though we have 40 styles of turf to choose from, we know that some people really need to see and feel these types of products before choosing to buy them. You want to be sure that you’re getting the perfect option for your project. When you stop by any of our SF Bay Area locations, you can. We’ll gladly provide you with free large 1’ x 1’ turf samples to take home with you. That offer isn’t limited to people based in the area. If you’re not from around here, we ship to any spot in the Continental United States. Are you a contractor? Then shipping is free. Also, we don’t want you to run out of ideas for how you might use our faux grass. To help you stay inspired, we publish blogs and newsletters on the subject. Best of all, we have the most competitive pricing in Northern CA. Want to find out more? Call us at 844-874-8873 or contact us online for a free estimate. There are many uses for residential artificial grass and commercial synthetic grass.. What you choose to do with it depends on your goals. For example, if you own a home, you may be looking to install a patio area with a nice green surface you don’t have to maintain. Faux grass makes it easy to do so. If you have kids, it makes for a safe yard for them to play on. Again, maybe you’re just looking for a way to save money. It helps you do that too. You could even install your own backyard putting green with it! Business owners also have many good reasons to make the switch. The curb appeal of your property plays a big role in attracting guests. A grass lawn requires time and money, but a fake grass lawn looks great and costs less. If you run a café, install our products to add an outdoor dining spot. Want to make your staff more content at work? With fake grass, you can put in an area for your workers to lounge and relax. These ideas are just a tip of the iceberg. There are many clear uses for artificial sports turf and pet grass. School districts across the nation are always seeking ways to save money. Often, it means cutting sports programs. This impacts teens who may have relied on sports as a way of reaching a better life. To address this, some districts have opted to switch to faux grass. The money they save allows them to keep sports in the budget. Since our products are lead-free, non-toxic, and don’t contain any crumb rubber, they’re safe for players. They also stay flat, even in all types of weather, which reduces the chance of someone being injured. On top of that, this surface stays in good shape, even after harsh rains. As a result, fewer games and practices are canceled. Pet grass offers benefits to everyone from dog lovers to kennel owners. No matter how much you love your dog, you have to admit that they can track a lot of dirt back into the house after playing outside. That’s not to mention the damage bigger dogs can do to your lawn. With our pet grass, you’ll have a lawn that can take a beating, and you won’t have to worry about your dog bringing dirt back in. Kennel owners attract more business thanks to faux grass. It’s easy to install an outdoor play area for dogs. People will be more likely to trust you with their pet care needs if they see you’ve taken steps to give them a safe play space. We make it easy for you to find turf tools and accessories in Walnut Creek, Contra Costa, CA. If you’re a contractor, ask about our Easy Seam machine. With this tool, you can install turf quickly without the use of glue. As you know, when you’re more efficient, you can take on more projects and make more money. 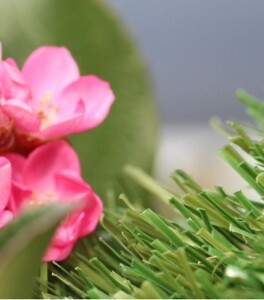 Fake grass doesn’t just help add beauty to the ground-level surfaces on your property. Our boxwood panels let you add greenery to your garden or indoor walls. Of course, we also carry golf flags. The best way to get a real sense of what we have to offer is simple: check out our full catalogue of products. We provide free delivery to this area and all other parts of the San Francisco Bay Area, CA. Not a local resident? No problem. We ship anywhere in the Continental US! 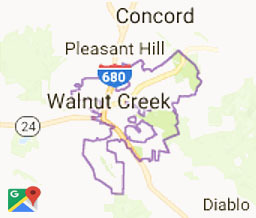 Looking for fun things to do in Walnut Creek, CA? You won’t have to look far. If you have little kids, take a trip to Heather Farm Park and Playground. This park stands out from others, thanks to a unique feature: fake grass mounds that children can slide down on sheets of cardboard. They’re safe, fun, and another great use for faux grass. There is a lot of space on the grounds for parents to spread out and enjoy while the kids play. There are also plenty of things to do in Walnut Creek, CA for adults without children. Stop by the Broadway Plaza Shopping Center for a retail experience like no other. Recently, the plaza expanded as the owners added new stores and outdoor lounge spots. Similar shopping centers across the nation have found that adding fake turf to such areas helps to draw in even more guests. As they work on building up Broadway Plaza, the owners may consider doing so themselves. No matter what your interests, there are things to do in Walnut Creek, CA. That doesn’t mean you have to live here to find uses for our products. Do you have a fake grass project you’re looking to get started on? Get in touch with Watersavers Turf. Chat with us online, or call 844-974-8873 toll-free and ask about getting free 1’ x 1’ samples. You should also ask about our free delivery offers and free estimates. No matter what your goals are, we’ll help you achieve them.